I attended several events the week of the Global Climate Action Summit September 12-14 and I must vent one of my gripes. I was excited to attend Spirit Rock’s event Loving the Earth. Spirit Rock is a meditation center nestled against the hills of West Marin and one of my “happy places”. In order to enter the event, they were putting Tyvek® wristbands on all the attendees. Unfortunately, mine was put on a tad too tight and when I went to loosen it, I realized it was made of plastic. Plastic wristbands at a climate action gathering? It amazed me that others didn’t see the disconnect. At the event some of my green heroes such as Joanna Macy and Julia Butterfly Hill were encouraging us to share what we were heartbroken about, feel our grief, and move into action to do our part. This post is my small attempt to remind organizations to plan zero waste events that align with their mission, brand, and values. Yes, it takes a bit more time and effort. But I argue you dilute your climate action message when you serve lunch in a cardboard box or use unnecessary plastic. Below are a few ideas for making your next event climate-friendly. Tyvek® is polyethylene, which is plastic. Spending the day speaking about climate change and climate action and requiring everyone to wear plastic broke my heart. Get clear on your needs and explore earth-friendly options. Can you tie a simple string around wrists? Or use a stamp? My call to action to Spirit Rock: please reach out and I’m happy to help you find an more earth-friendly alternative. 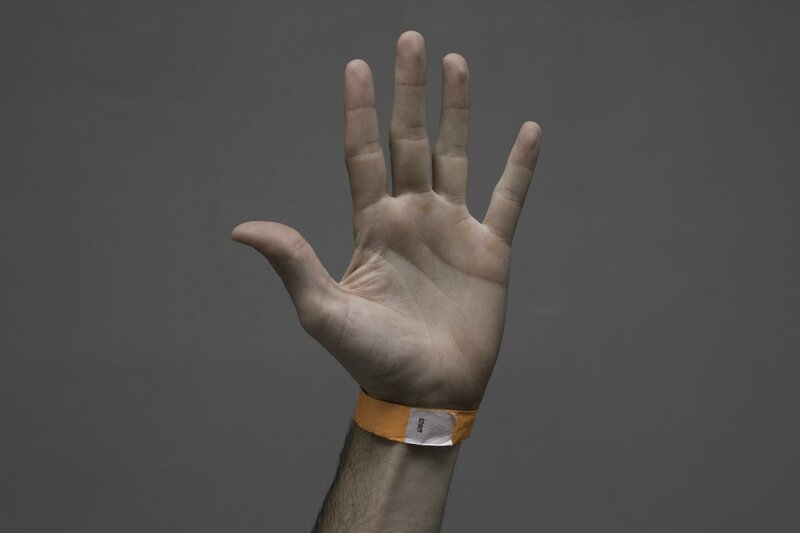 If you MUST use them, set up a system for recycling the bands at the end of your event. According to My Plastic Free Life, at that at a minimum, you can collect and recycle Tyvek® materials by mailing them back to DuPont in a special bag they offer. Since they are made from #2 plastic, they can be recycled, but not in your curbside bin and not in any regular plastic bag recycling program. DuPont has created a Tyvek® take back program, but their Website is not clear on how one gets the special bag. My Plastic Free Life says for small quantities (less than 25), stuff them in an inside-out Tyvek® envelope and mail them to (I’m working on confirming this): Tyvek® Recycle, Attn. Shirley B. Wright, 2400 Elliham Avenue #A, Richmond, VA 23237. My call to action to thought leaders such as Julia Butterfly Hill–consider only speaking at events that commit to going Zero Waste, or at a minimum, commit to avoiding plastic. For my readers, my call to action is: for your next event, take a few moments to think about how to minimize the footprint of your event. See the tips below for how to make your next event more climate friendly. Minimize use of Plastic: Work with your caterer to serve sandwiches, snacks, cookies, fruit, and desert on platters without wrapping. Minimize the use of plastic stirrers, straws, and coffee cup sleeves. And as discussed above, avoid plastic wristbands. Avoid Box Lunches: If possible, avoid boxed and pre-wrapped sandwiches. If sandwiches are served, have bread, meats, cheeses, condiments on platters, or have pre-made sandwiches on open platters, not pre-wrapped and boxed. If lunches must be pre-made, use paper bags. Paper boxes are wasteful even though they are recyclable. Order Recycling and Composting Bins with Signage: When you select your venue, specify that you will need recycling and composting bins with proper signage in the meeting room and where food will be served. Before your event, confirm that there are containers with signage for compost, recycling and trash. When possible, assign someone to help participants properly sort their waste. Go Meatless: Consider offering a meatless event, which reduces the carbon footprint on your event and choose local, organic food when possible. Ban Bottled Water: I’ve said it before. I’ll say it again. Please no bottled water. Offer water in pitchers with paper cups that can be composted. Food and Water Watch offers a resource to help you plan a bottle-free event called Free Your Event from Bottled Water. Offset Travel: Carbon offsets allow you to “compensate for” your personal carbon emissions by supporting a project that provides greenhouse gas reductions. Offsets can be purchased at a range of online retailers, such as Cool Effect, a local Bay Area company that allows individuals to support a range of projects that reduce carbon and provide a social impact. 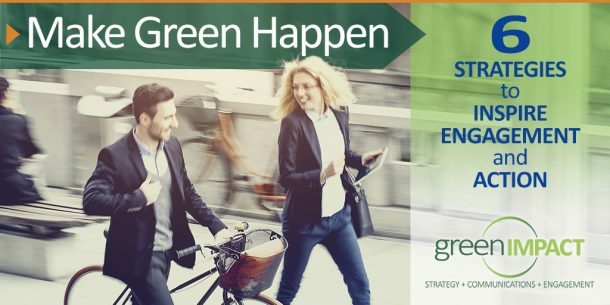 Green Impact is a sustainability strategy and communications consultancy that helps companies, universities, land conservation organizations and NGOs transform green intentions into action. 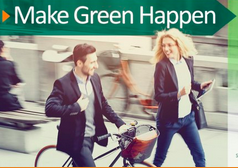 We make green happen by guiding organizations to build a brand and culture rooted in sustainability.